A Red Flag Warning issued by the National Weather Service remains in effect until 8 p.m. Tuesday evening, Oct. 16. Expect gusty winds and low humidity. 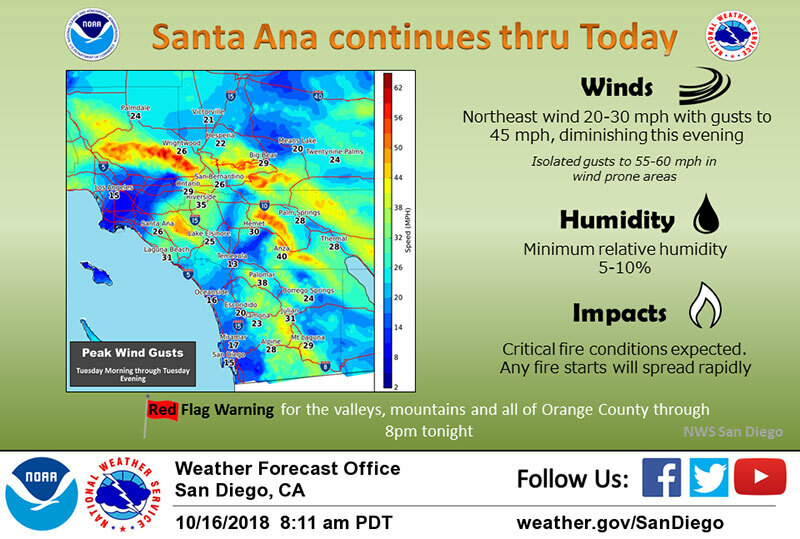 Fire danger is extremely high in the San Diego County mountains, valleys and foothills below 6,000 feet. A Red Flag Warning means that critical fire weather conditions are either occurring now or will shortly. A combination of strong winds, low relative humidity and warm temperatures can contribute to extreme fire behavior. Wildfires are possible due to the low humidity and could spread quickly due to the winds. Areas of northeast winds are expected between 20 to 30 mph this morning with gusts to 45 mph diminishing during the afternoon. Isolated gusts up to 55 mph are possible in the morning in rural areas. Humidity will fall to around 10 percent from mid-morning through the afternoon. 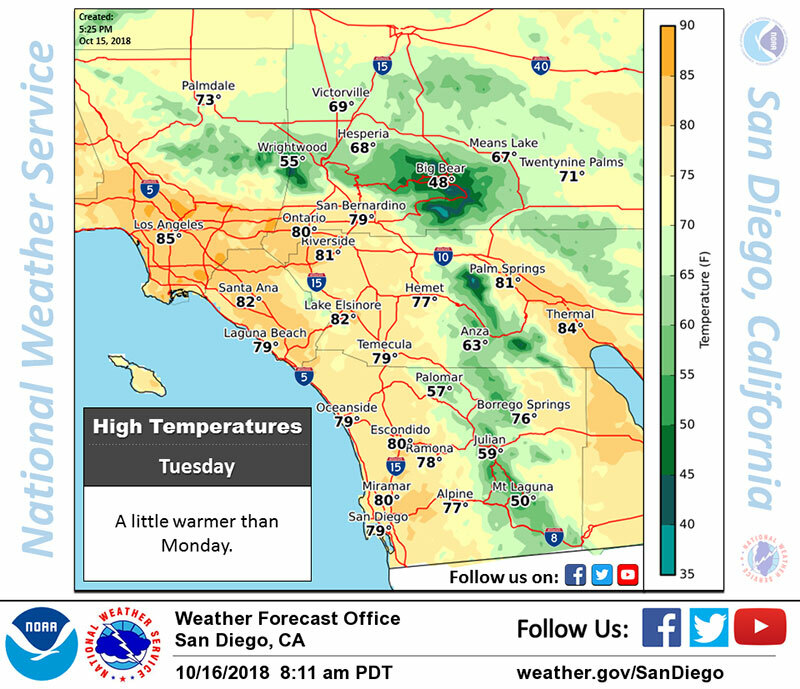 Weaker and less widespread winds are expected Wednesday and Thursday with a gradual recovery in humidity. Fuels will continue to dry today, increasing the fire threat. Gusty winds continue through this evening. 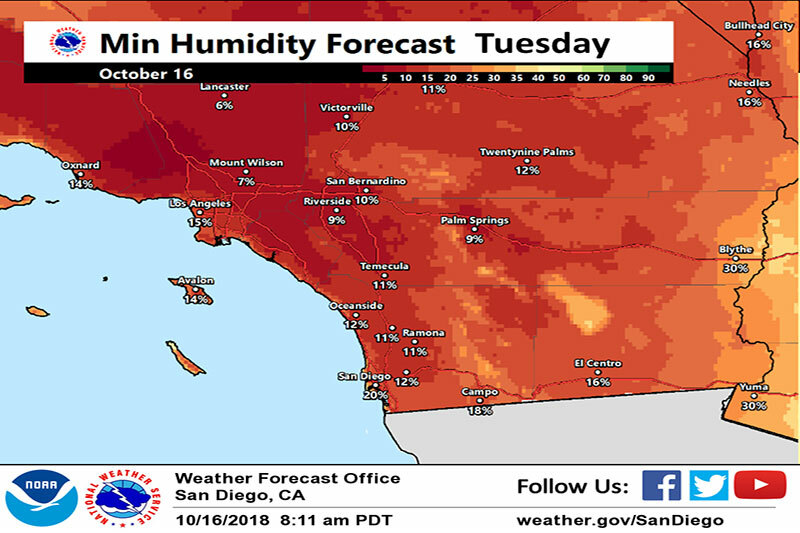 Minimum humidity will be 5-10 percent, and critical fire conditions are expected. Any fires that start will spread rapidly. Outdoor burning should be avoided. Exercise caution outdoors.